Monochrome is a trend that never goes out of fashion. Combining black and white interior elements creates an elegant atmosphere and adds a sense of sophistication. If the bright colours and floral prints aren’t your cup of tea this spring, we’re sure you’ll appreciate this timeless classic that is monochrome. 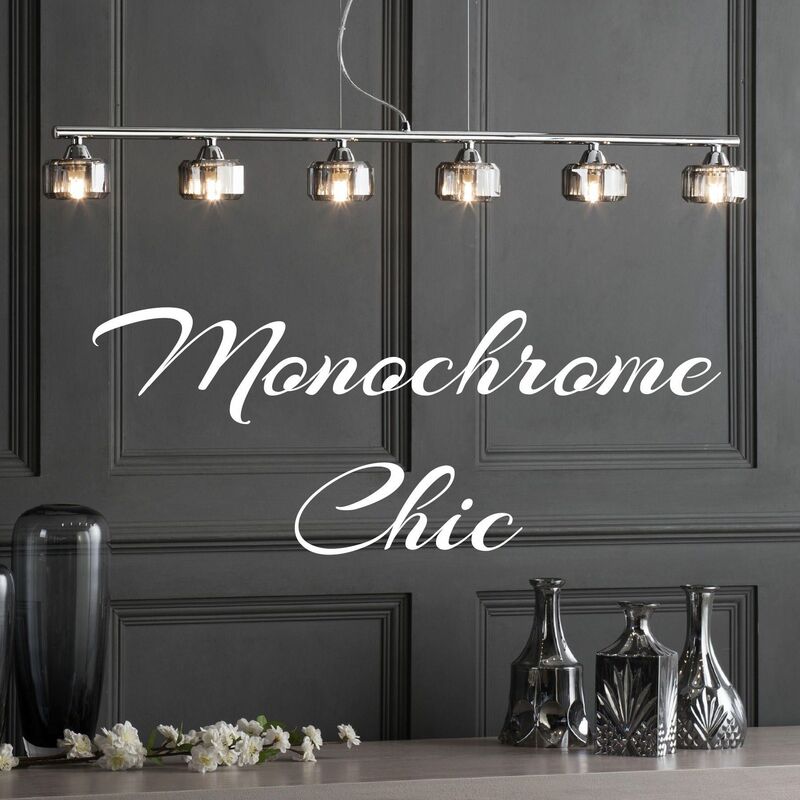 Monochrome lighting and accessories will compliment any base colour you might have chosen for your interiors. 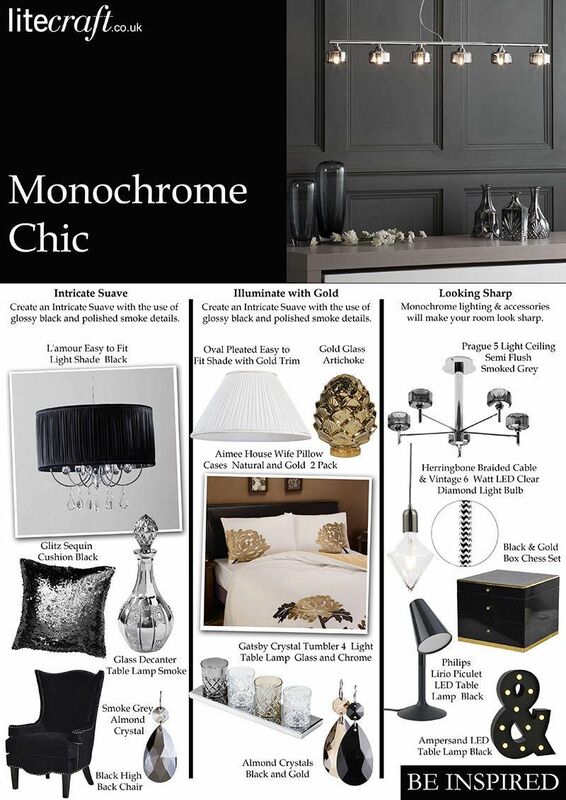 Whether it’s white, grey or purple, monochrome will add a feeling of timeless chic to any hue. It’s such a versatile colour combination that not only works well with other colours, but can also be integrated in almost any style of interior. Pair it with soft fabrics and girly designs for a romantic look, or choose geometric patterns and clean lines for a more industrial look. Combining monochrome and gold will add a luxury feel to your interiors. There are so many options, all you have to do is find your monochrome crush. Here are some ideas to get you inspired. Create an Intricate Suave with the use of glossy black and polished smoke details. When it comes to choosing the perfect chandelier for your dining room, go for eye-catching designs that will impress your guests. Our L’amour Lighting Range is perfect for that. 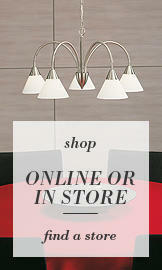 These elegant chandeliers are available in different sizes and 2 elegant finishes. Pleated shade will defuse the light softy while, the embellished crystals hanging from the curved frame will add a touch of contemporary sparkle to your room. Black furniture always makes the room look tasteful, go for refined shapes and finishes to create an exquisite look. Our Glitz Sequin Cushion in Black will look ravishing on a lush high back chair or a lavish sofa. Large mirrors and reflective surfaces would go great with this look. Illuminate your bedroom with gold and sleep like a royalty. Choose white as the base colour and add hints of black and gold for a rich and calming atmosphere. You can easily give a new look to your existing chandelier simply by changing the crystals. Replacing clear crystals with black and champagne coloured ones will add a sophisticated touch of colour to the whole room. Make your night’s sleep feel extra luxuriant with our Aimee House Wife Pillow Cases. Featuring a gold floral print on the white pillowcases this will be a lovely feminine addition to any bedroom. Create a calm and romantic ambience with a beautiful bedside table lamp. Our Gatsby 4 Light Table lamp features 4 stunning cut glass light shades in clear, smoke and champagne finishes on a polished chrome lamp base. The light is dimmable allowing you to easily change the level of ambience in the room. Add contemporary monochrome lighting and accessories to your living room and make it look sharp. To create a bit of an industrial feel in your living space go for exposed bulbs and trendy designs. Our Decorative light cables and exposed filament bulbs are great for those of you looking for an urban style lighting. Our new range of LED filament bulbs are not only energy efficient, but also dimmable, giving you the power to change the mood of the room with a simple turn of a switch. Quirky accent light will give the room a unique feel and express your personality. Our Ampersand LED table lamp will fit in perfectly on a shelf in-between two decorative initials that represent you and your loved one, for example. This look is all about original designs and smooth lines that create a personalised minimalist look and turn your living room into the heart of the home. What’s your favourite look? What monochrome lighting and accessories would you go for? Let us know in comments below.